Wouldn't you love it when all your loving family and dear friends made it to your big wedding day? Of course, it is a day to celebrate and rejoice the wedlock, and make each second as memorable as possible. The wedding cake, the bride and the groom, the flower arrangements and the food – all are very much appreciated by the guests and will be remembered. But a wonderful way to thank your guests and provide them with a lasting memory of your wedding is through beautiful wedding favors. Wedding favors need to be original and should be something of meaning to your family and friends. Moreover, they should also complement the wedding theme. Personalized favors give the couple a chance to add their very own personal stamp on the giveaway. In this way, the wedding gifts will remain uniquely about the couple for life! 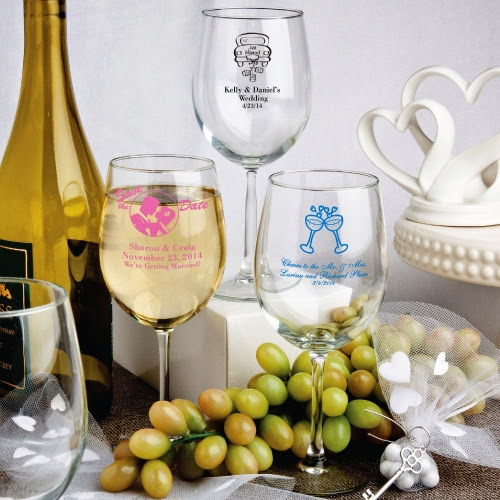 You can get personalized glassware wedding favors that you can give away at your reception to your family and friends as a token of appreciation. You can choose from stemless wine glasses, glass coasters, bistro glasses, shot glasses, stemless champagne flutes, and champagne flutes. They can be customized perfectly according to your requirements and personalized with the couple names, wedding dates, or special messages. Regardless of the theme of your wedding, you will surely find personalized glassware to match your color schemes and themes. Personalized glass items can not only be given as a favor but also as a gift to people who have been helping you out on your big day. Apart from serving as a favor, personalized glassware makes a nice wedding reception table decoration. Wine glasses, glass coasters, bistro glasses, stemless champagne flutes and champagne flutes inscribed with the couple's names would look good on tables and add to the charm of the wedding decorations. 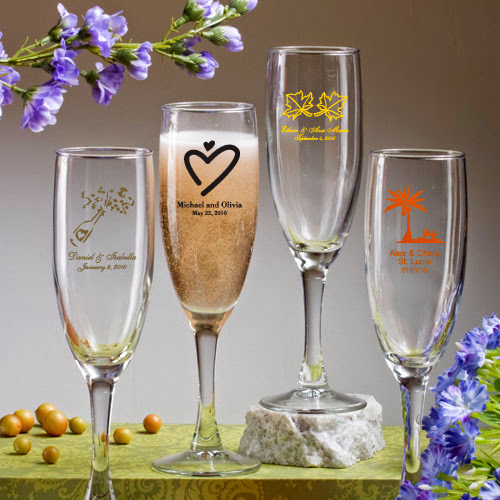 Personalized glassware favors at your wedding will surely not be tossed aside as your guest will treasure them for a long time to remember your special day!